A blanket of winter white snow is beautiful to look at, but it can be quite a chore to remove from your car and driveway when it’s time to venture out. If roads are still treacherous, it is best to stay put in the warmth of your home, if possible. However, we understand that staying home is not always an option. And since removing snow and/or ice from your car is a legal responsibility, here are some suggestions to speed up the process and make it a bit easier! Be sure to allow plenty of time, especially if your arrival is time sensitive. Depending on road conditions, a winter storm will add time and stress to your ride, and you will want to drive as slowly and safely as possible. Gather your snow-clearing gear ahead of time. You will need a snow shovel, ice scraper and a brush or small broom if your ice scraper doesn’t have one on it. Start your car and turn on the defroster and heat. Let your car heat/defroster system do as much work for you as possible. Hopefully, you have sufficient gas to leave your car running for a short time in order to warm up and thaw out. You will want to allow a few minutes for the interior heat to thaw out some of the snow and/or ice on the outside of your vehicle. This will make your job a lot easier! Words of caution: Never allow your car to run in a closed area like a garage, and be sure to clear any snow accumulation away from your exhaust pipe before starting the car and leaving it running—especially if you are sitting in the car while waiting. Having your exhaust pipe covered or buried in accumulated snow will force the carbon monoxide fumes to back up into the car’s interior. This odorless gas can kill people, especially babies and children, as well as animals in minutes. Brush off your car. Start by brushing all the snow off your car from the top down. Don’t forget to remove the snow/ice from the roof of your car. The snow on your roof will eventually blow off the top of your car and could create a hazard to the drivers behind you. A soft bristled brush is recommended, don’t use anything hard or rough or you risk damaging the exterior paint. Scrape your windows. If the ice is really thick, allow the defroster to run a little longer. Do not put hot water on your windows to help with this process; it can cause your windows to crack. 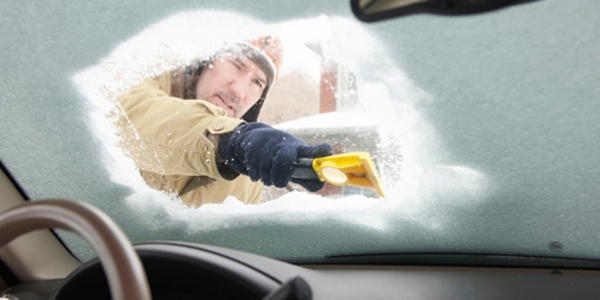 Make sure you clear all windows so that you don’t have any blind spots when driving. Don’t forget the little things. Remember to remove snow or ice from side mirrors, headlights and flashers. You should also clear your wheel wells and exhaust pipe (see #3). Remove snow around your car. Using the snow shovel, remove all the snow around your car and clear a path to the road. Salt or kitty litter can aid in this process. Don’t forget to use your scraper or shovel to hit large pieces of snow/ice from behind your wheels. Some states have laws that require you to remove all the snow from your cars before driving on the roads. Whether your state has this law in effect or not, it’s a good idea to take the extra time to remove all snow and ice before starting your trip. Not only will it make your trip safer, it can also prevent an accident for those behind you. Remember that the best course of action is to just stay off the roads until they are clear. However, we understand that many people need to go to work (especially essential personnel) or have some good reason to be on the road. If you have any tips or suggestions on snow removal that we didn’t mention, please share below in our comments section. Thanks for your feedback and we wish you safe travels this winter! This entry was posted in Safety Tips, Tips for Car Owners by Robin Beck. Bookmark the permalink.